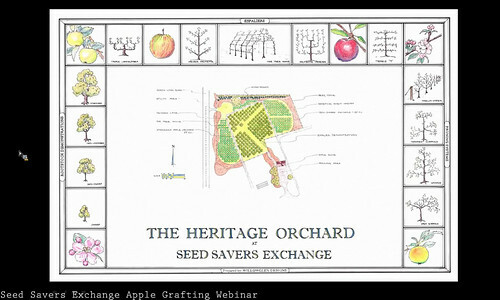 Yesterday Chiots Run tweeted about a Seed Savers Exchange webinar on apple grafting last night. Because they're central time and we're eastern and the time slot straddled bed time, I wasn't too sure I'd get to watch it. I ended up seeing the first half and am anxiously waiting for the recorded version to be posted to their site. You can't see it very well in my screen capture, but the tree house formed espalier is especially amazing. I can think of a million ways to tweak it so it would work in our yard.